I just finished plaiting this sling two nights ago. It is made from wool/acryllic yarn. Brown and stone colored. The retention loop is 6 strands over a 2 strand core. The retention cord is 10 strands over a 6 strand core. Where it goes thru the pouch, I broke it back into two plaits of 6 over 2. Then back to 10 over 6 for the release cord. So it has a total of 16 strands in the cords. The cords are nice and stiff, except for one spot in the retention cord where I tried to change the plaiting a bit. This did not work, so I abandoned it. Later I realized that it did not pull as tightly as the rest. In the retention cord you will notice a marked spiraling to the plait. I don't really know what caused this to be so bad, but it is only in the plaiting, the cord does not twist. About 2/3 of the way to the end of the retention cord I started doing something right and it sraightened out. The release cord is much better, though not perfect. The pouch is leather and made similar to my other pouches. The sides of the pouch are stitched around the two cords. Have you tested it? How does it work? I would like to try to braid me a sling... But I will have to wait until I have more time and until I know how to do it..
Good job! I pity I can't to braid. More terms will show up as you search, but these should get you started. You can also go the the Tandy Leather web site and buy books on whip braiding. I use the simplest of plaits for my sings. It looks good and is strong and easy to work with. That is truly a nice sling. Makes me think that I aught to try ding something similar now that the weather has turned cold again. Nice work! I got some inspiration the other day, and since I have some yarn at home, I braid me a new sling. 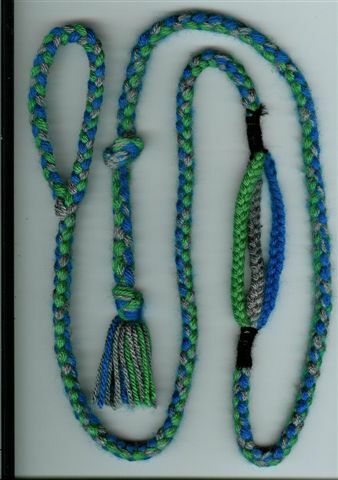 strings of each colour. 5 Meter long. Turn them doubble, make a normal 3-braid for my (this time) wrist loop. Then I put all yarns together, and with 9 strings x 4 I braided a 4-braid. When I came to the pouch, I separate the colours and made three normal 3-braids. And then again a 4-braid until I reach the length that I wanted. And a knot to finish. I took some black yarn to stabilisise the pouch a little bit. So, this is my new one. It turn up little bit too short and I haven´t test it yet. But I will. Here is a tip: Take half the strands in each hand. Lay them flat, one above the other. This makes an inverted "v" opening toward you, tied or clamped off away from you. Now, tak the top strand on one side an wrap it around the back (away from you) and bring it through the middle of the strands on other side. Lay it across the lower strands and back onto the side it originated on, where it becomes the bottom-most strand. The strands never change sides. They wrap around the lower half of the strands on the other side and then return to their "home" side as the bottom strand. Note that I did not number the strands. That is not important (particularly with only a few). They do need to be in multiples of four, however, for the easiest plaiting. Once you understand this, all the illustrations will begin to make sense. You are dealing with two flat bundles of strands that end up as a round plait. 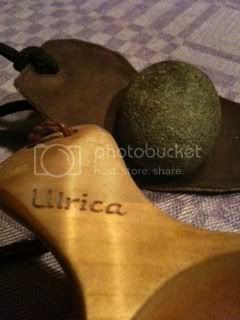 Nice work, Ulrica! You can wear it as a sash for the 'Peruvian' look. Impressive braiding, too; I'm still stuck in 3-braid. That's a wrist loop, right? Does the three strand pocket really hold stones better? A 4-braid is really as easy as a 3-braid. And yes, I made a wristloop this time, to test it. I will found out when I can test it. Nice work. You are certainly not afraid to try something new. I think the pouch will work well with larger round stones, especially if the three plaits are stiff. I threw some tennis balls with my newest sling (above) a few days ago. Either I am getting better or stiffer slings work better inherently. My accuracy was much better, though still not great. I did not use any of my smaller slings, only the peruvian and my new one. These are all stiffer. The feel was totally different that the last time I used my smaller, 4 plait slings. If nothing else, the larger cords are easier to hold and control. Plus, they don't twist very much, if any at all. - More or less. But i learning more and more. The pouch are not so stiff, but I think it will be alright anyway. I haven´t so much time so it must go fast to make, that´s why I like this version too. One can make this sling in less then 2 hours. Nice to hear that your accuracy is getting better and better. 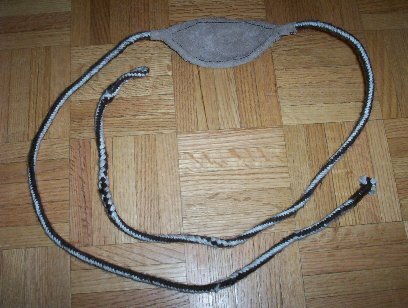 This sling I made is also very stiff, so I´m curious how I will sling with it! Jeff, Do you find the leather pouch to last longer? I wonder, is there any historical references to slings combining leather and braiding? Seems obvious from this end of history. yeah, I agree with mgreenfield!